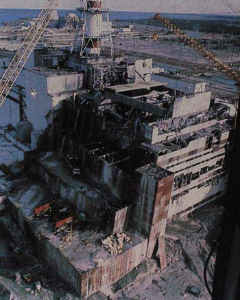 On April 26, 1986 the Chernobyl nuclear power plant accident produced a plume of radioactive debris over the Ukraine, Eastern Europe, Scandinavia, UK and eastern USA. The short term effects of the accident were disastrous. After the explosion, a nuclear cloud enveloped all of Europe. Belarus received about 60% of the contamination. Two hundred people were hospitalized instantly with 31 dying (21 from acute radiation poisoning). The long term concerns center around the contamination of the soil. Thyroid cancer in and around the Belarus has also risen sharply since the disaster. Two theories concerning the accountability of the accident have been posited. One assigns the blame for the explosion has on both the reactors' design and the designers who knew of its flaws and limitations yet did not inform the operators. Others have placed blame only on the operators. Both theories were based on separate studies which were heavily influenced by different groups, including the plant's designers and the power plant's employees. Independent studies now contend that no theory is absolutely correct. BBC Story chronicling the disaster. BBC Story chronicling the continuing hazards around Chernobyl.